My Easter Lilies are now blooming. I have tried in vain to get a picture that really captures them. This one will have to do; my lens was fogged up because it was cooler inside than outside. Very much feeling the Presence right now! 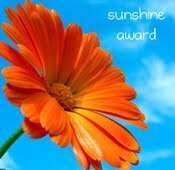 I wasn't sure if you do awards or not, but I am bestowing upon you the Sunshine Award! Visit my Saturday post if you want to get it. If not, you won't hurt my feelings!